Acupuncture involves the insertion of hair-fine needles into specific points on the body along the course of meridians, or channels. It enjoys a three to five thousand year history, and has gained much popularity in the West due to its effectiveness and safety. Each year, roughly 10 million people utilize acupuncture in the United States, and it is quickly becoming one of the premier modalities in the integrative medicine worldwide, especially in pain management. Acupuncture treats more than pain, however, having profound effects on neurological, immune-related, psychological, gynecological, and many other disorders. Please see the conditions treated page for more information. Weekly treatments are typical, though in some situations more frequent visits may provide better results. Effects are often felt immediately. Traditionally, acupuncture is said to stimulate the flow of qi and blood along various channels. When a hair-fine acupuncture needle is inserted through the skin, it activates several systems at once. The nervous system, the musculature, the vasculature, the immune system and the network of spaces between structures, all react to the presence of the needle. Because the needle is so small, minute and subtle changes can be manipulated along the course of nerve pathways, muscle groups, blood vessels paths, and within the realm of fluids and pressure systems between structures. 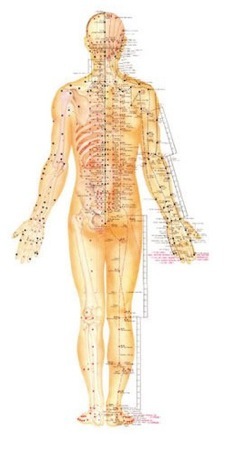 Acupuncture channels are maps of this synergistic activity throughout the body. This is why needling the point Nei Ting in the foot clears the nasal passages, sometimes immediately. This is also why needling the point Guang Ming in the lateral lower leg, or Zhi Yin on the pinky toe, both traditionally used for disorders of the eyes and head, will activate the visual cortex of the brain. Qi exists in the realm of the unseen. 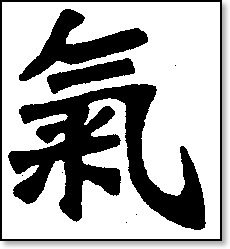 In the West, there is no concept of qi, but it is commonly translated as "energy", though it does not have this meaning in Chinese. Generally, it is simply left as "qi" because the full meaning imparted by the character, (and experienced in clinic), cannot be captured by a single English concept. The character for qi represents a grain of rice cooking inside a steaming pot, depicting an active and transformative process. Rice is being transformed into nourishment, and water is being transformed into steam, which in turn transforms back into water. Qi is both the form and the transformative process. It has been referred to as something in a constant state between energy and matter.